Weekly Photo Challenge: Good Morning | Oh, the Places We See . . .
Last week’s WordPress Weekly Photo Challenge focused on a familiar phrase: Good Morning! So, I said to myself, why don’t you spend Saturday of your weekend in Idaho at the Farmers Market? So here I am at 10th & Grove saying, Good morning, Boise! 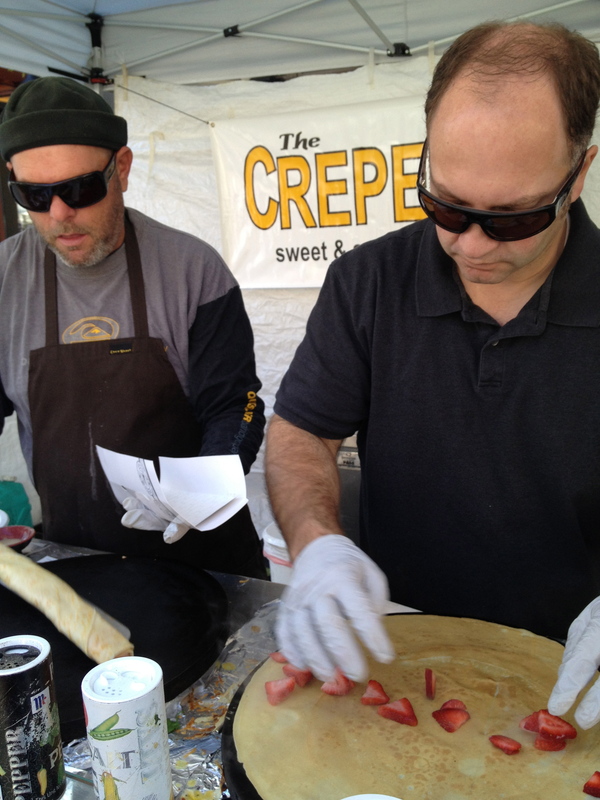 My favorite breakfast item came from two hard-working guys from The Creperie spreading delicate crepe batter on a hot griddle, filling it with anything from Nutella and strawberries (my choice) to asparagus and cheese, and then rolling the whole shebang in paper cones. Portable. Tasty. Warm. A treat on the street! 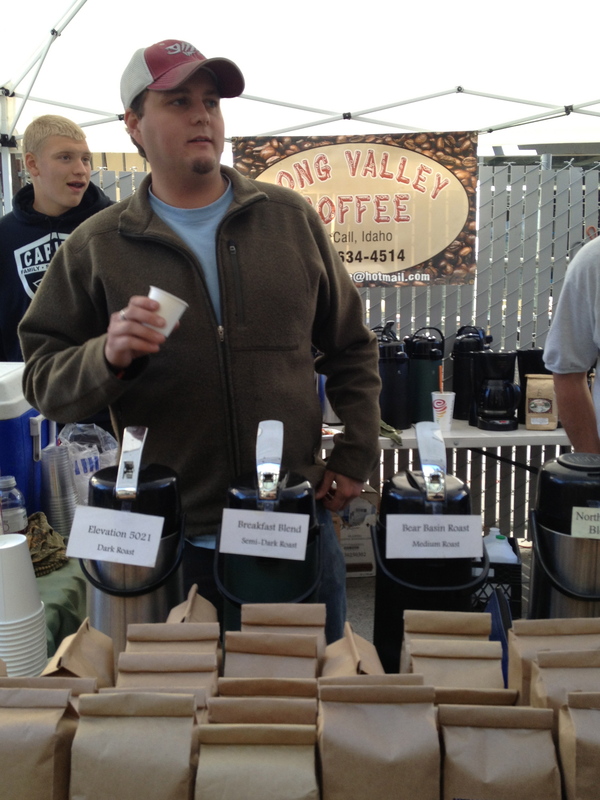 In the spirit of drinking local, I lined up for a cup of Bear Basin Roast from a cheerful, albeit chilly, vendor from Long Valley Coffee based in McCall. Mmmm. Rich, full-bodied, and my first cup of coffee with the word bear in the title! 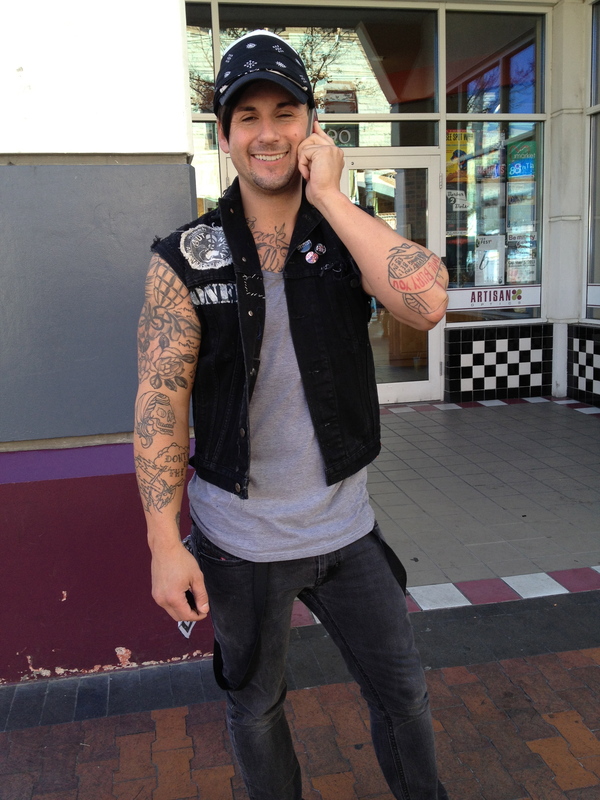 Finally, I spied this happy, tattooed guy talking on his cellphone. When I asked if I could take a picture, he gave me a thumbs up. And then said, Have a good morning. He smiled. I smiled. And we bridged the generation gap if only for a few seconds. Made my day with a good morning start! Nothing like a great smile to start your day! P. S. Want to see more pics of the Boise Farmers Market? Come back for my next post. There’s everything from gourd vendors to a balloon man and who knows what else! You gotta get up on a Saturday and head to a farmers’ market near you. I can almost guarantee a Good Morning. This entry was posted in Farmers Market, Idaho, Restaurant, Travel, Weekly Photo Challenge and tagged Boise, Boise Farmers Market, crepes, Idaho, Long Valley Coffee, postaday, The Creperie. Bookmark the permalink. Hello, Boise (from Idaho Falls)! Wooot Wooot! Really? I was that close to Free Range Cow! I’ll have to see where Idaho Falls is on the map and go there, too! Thx for commenting! Oh, my goodness – next time, can I stow away in your suitcase? Boise’s just an hour drive from my home! I love the farmer’s market, and you captured it well. I’m enjoying looking at all the different tattoos! So glad to hear from an Idahoan! I love this state! Been working with teachers in Idaho City and Nampa. Will try to post more pics of Boise Farmers’ Market this week. Had a great time! Thx for reading!! We even have a downtown Knoxville crepe lace that serves savor crepes male enough to share! Come see us! And thanks for commenting. Really enjoyed this trip around with you. Thanks so much for taking a look and leaving a comment! It was a fun morning in Boise! Thanks so much for taking a look! It was fun putting this together! It must indeed have been a good morning for you too. You sure lived in and captured those moments through your photos, didn’t you? Thanks for reading and commenting! It was a fun morning. What fun, I hope you had a great time in Boise! It WAS a lot of fun. And the people are so genuine! Thanks for reading! !